Highlights from Day 2 of Zuckerberg's Testimony: "More Choices in Choosing an ISP Than Choosing a Social Media Site"
After five gruelling hours last night, Facebook CEO and Chairman, Mark Zuckerberg, is now in another session to testify in front of the House Committee on Energy and Commerce. You can watch Zuckerberg’s House Congressional testimony in the following video. The 33-year-old billionaire is now facing his second day of grilling before Congress in an effort to respond to concerns following the Cambridge Analytica scandal. While lawmakers had five hours to grill Zuckerberg last night and some of them may have appeared as going hard on him, most of the time was wasted on how Facebook works. “It’s clear now that we didn’t do enough to prevent these tools from being used for harm,” Zuckerberg had admitted. Last night’s session also revealed that Zuckerberg himself doesn’t know how long it takes Facebook to remove all of your data once you choose to leave the platform and admitted that the company keeps a backup of data for an unspecified short period of time. It is likely that lawmakers will push Zuckerberg on questions that he tried to avoid last night. Going into the day 2 of Zuckerberg testimony, we will be bringing all the highlights from the hearing right here. Mark Zuckerberg is now reading his opening statement to the House Committee on Energy and Commerce. You can read this testimony here. Would Zuckerberg say yes to minimizing the data that is collected through default settings? When asked if default settings will be tweaked to make sure not much data is shared with Facebook, Zuckerberg avoided saying yes, adding that it’s a complex issue. Potentially. Zuckerberg said the company and third party companies will conduct a thorough audit to see if any other apps managed to siphon off user data. Yesterday, Zuckerberg had said that at least two other companies had also managed to take user data without permission. Zuckerberg said that people come to one of Facebook’s products 100 billion times every day! 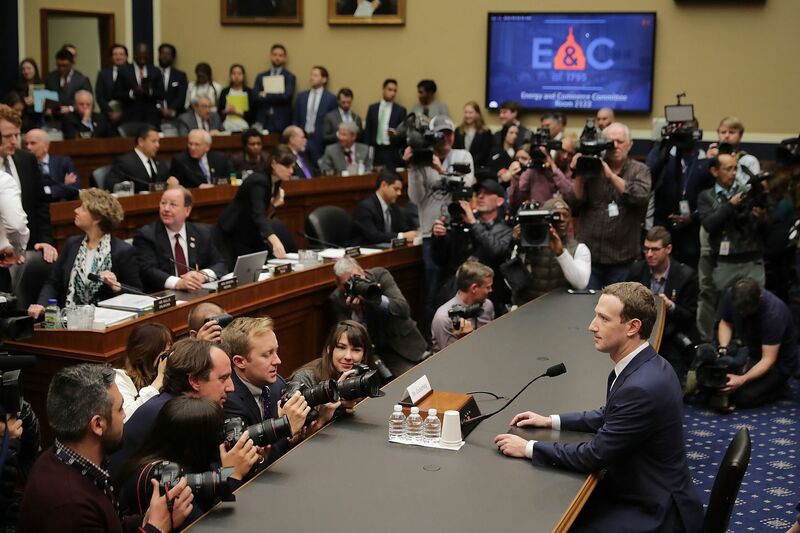 Congresswoman Marsha Blackburn said that Facebook community “is starting to look like the Truman Show.” Who exactly own this “virtual you” and who owns user presence online. Is it Facebook users or Facebook? “I believe everyone owns their own content online,” Zuckerberg responded. Diana DeGette grilled Zuckerberg for not knowing about lawsuits and penalties against Facebook that didn’t result in users getting any money or Facebook losing any money. After referring to the FTC consent decree and Facebook’s continually growing profits, she said that the reason why Facebook continues to engage in bad behavior is because it continues to make profits regardless of controversies, data abuses, or privacy scandals. This is an extremely misleading statement since Facebook users do NOT have control over their data. If you decide to remove some of the content you have already posted, you will still be targeted by advertisers using that same data. If Zuckerberg suggests that Facebook users have “complete” control of their data, he should make sure that when we decide to remove some data, it could no longer be used for targeting or any other purposes. When are GDPR protections coming for Americans? Congressman Jerry McNerney asked if the company will roll out GDPR protections to Americans when it does for Europeans on May 25. Z: We are working on doing that but I don’t have an exact date yet. M: So, it won’t be on May 25? Z: We are working on it. Representative David B. McKinley questioned Zuckerberg over enabling drug epidemic on the platform, by hosting illegal pharmacies. McKinley added that Facebook is being used to circumvent the law and allow people to buy highly addictive drugs without a prescription. Zuckerberg said Facebook removes the content when flagged by users. McKinley: What about those 20,000 people you said take down illegal content? Where is your accountability in this? Zuckerberg: We need to build better AI tools. When asked by Representative Ben Ray Lujan if Facebook creates shadow profiles on people who have never in their life signed up for Facebook, Zuckerberg said yes, but it’s done for “security” purposes. Yikes! Lujan also asked why it took Facebook to turn off data scraping features only last week when the company first came to learn about the misuses in 2013 and then again in 2015. Okay then. Not sure, why we have had over ten hours of this testimony (including yesterday’s session). She lists a number of questions that Zuckerberg had responded to with either a “I don’t know” response or a “my team will get back on this” answer. She also brought up Facebook Pixel, which is another way the social giant tracks users across the browsers. She also wanted to know how many Like buttons there are around the web. Zuckerberg again said his team will get back on this. Facebook CEO said yesterday that Facebook is responsible for the content on its platform. Since then, several lawmakers have asked if the company considers itself a media/publishing company and not a tech company. Zuckerberg insists it’s not a media company. However, when asked if he is “legally” responsible for the content when he said he’s responsible for it, Zuckerberg didn’t really give a direct response. Kevin Cramer from North Dakota said that he has more choice in selecting internet service providers in rural North Dakota than he does for choosing a social networking site hinting at the monopolization fears. And… that is all from today’s session. Based on over 10 hours of Zuckerberg’s answers, do you believe if Facebook is rethinking its platform and working on some significant changes?